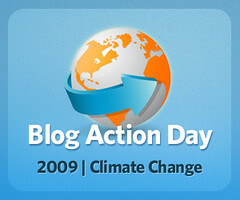 Today, October 15 is Blog Action Day around the blogosphere. Those thousands of bloggers who have signed up to write about this year’s theme Climate Change, are sitting down and tapping out individual responses. The idea is simply to spread the word. Maybe it’s preaching to the converted, or singing to the choir of our own smart tribe, but we write from a personal angle about an issue that’s bigger than we collective bloggers combined. Perhaps we do this to assuage some sort of guilt, knowing we contribute to the problem. Perhaps it’s to create a collective sense of purpose. And maybe it’s just by writing about it in this way that we are obliged to take 20 minutes or so from our busy lives to think a little more deeply about what it means to each one of us. It’s hard to miss the reality of climate change. In my own neck of the woods, and during the past month I’ve experienced immense dust storms that have blocked out the sun, filled eyes and noses, and given rise to mordant apocalyptic jokes. In late September windstorms swept across Australia over the course of a week dumping tonnes of precious topsoil out to sea. This week in my home city the dust was raised again as winds blew ferociously, rain storms broke overhead, and hail fell, and all in the space of a few hours on one day. This morning I drove through local countryside smoking from fires, while water-bombing helicopters buzzed overhead. As I write, firefighters in various parts of Australia are on alert and continuing to battle bushfires, and it’s not even summer yet. It might as well be; the countryside is tinder dry, and conditions are ripe for a disastrous summer. We Australians are terrified of uncontrolled fire in our old, dry land; earlier this year in Victoria lives were destroyed with a speed and ferocity that still seems almost unbelievable. We check the skies on a daily basis. We long for rain – slow, steady, long, drenching days of rain, the kind we knew as kids. We read about and listen to the debate, hoping that common sense and politics will converge before, during, and after the United Nations Climate Change Conference in Copenhagen later this year. We aim for a lighter carbon footprint, a term I wondered about a year ago when I wrote about BAD here on Groundling. And so as individuals we try to do our bit; we sign up for solar-powered panels, and pay the extra few dollars on an air fare to offset carbon emissions, we turn off lights, refuse plastic bags, grow our own vegetables and reduce the food miles. Small towns ban water in plastic bottles – every bit helps. And still the figures seem astronomical … beyond our capacity to control almost. Certainly the forces of nature seem beyond our control. It’s no wonder it all seems overwhelming, and why many find it all too hard, and just hope that things will get better. That’s no excuse of course, just the reality of people under siege. Perhaps that is why we take some measure of comfort in doing things at home and at work that we hope will make a difference. Arts companies are doing their bit in this regard. It’s probably no coincidence given the date, but I read today in one of my blog feeds that New Leaf Theatre in Chicago is distributing ‘green programmes’ via smartphones as an alternative to the time-honoured paper artefact. The paper used to create what, to some, are precious memories of performance, are being reduced. This is a smart move; unsold, unused programmes are trashed or pulped in their thousands of tonnes each year. As I write this, the company I work with Queensland Theatre Company is squaring off with other state finalists for a national award through the Australian Business Arts Foundation. The ABAF awards honour the best relationships between business and the arts in the areas of partnering, volunteering, and giving. Queensland Theatre Company and URS, a global engineering and environmental services firm, embarked on achieving Queensland’s first ‘Green Theatre’ by working together during 2008 to create a carbon neutral production of The Importance of Being Earnest. They took out a state award, and are vying tonight for national recognition. Other arts companies throughout Australia are engaging with sustainable, green practices like this. The learnings from such partnering between the arts, engineering, and environmental science contributes to a growing body of knowledge about how human activity contributes to global warming, and in turn, assists in providing strategies to organisations to offset the emissions created. Meanwhile, and in our own ways, we do what we can. We hope that every bit helps. Update: The ABAF partnership of the year was won by Bangarra Dance Theatre and Boral Australia. Congratulations! What on earth can I say or do as an individual about poverty? What I can add to this debate is neither ground-breaking nor especially original. I am sure today there are posts that are far more inspiring … I hope so. But this is a personal response because that is what I believe is needed. BAD has forced me to think about poverty and my relationship to it during this day … indeed it is now BAD+1 where I’m writing from in Australia … it’s taken me that long to come around to putting words down. I thought even of not writing anything as a response, but of course that serves no purpose whatsoever. The very community here is what supports us all. Here is what I have been thinking through during the past 24 hours or so. Like many privileged people, I have acquired the materialistic bug over the years. I like shiny things, gadgets, being what I call ‘comfortable.’ No these are not the basics: food, water, shelter; I’ve never lived below that economic marker that politicians and social workers call the poverty line. I am privileged through accident of birth, the acquisition of a good education, and a career that has helped to pay for those nice things in life. I am privileged through family and friends, acquaintances and where I live. I can travel freely, live in a society that gives me as a woman and a citizen freedom of a kind unknown in many other places. What is my responsibility then to those who have none of these things? Do I have a responsibility? My education, moral and social inclinations tell me that yes, I do. The frustration is how to do something … anything to make a difference. Do I believe that one person can make a difference to a subject as appalling as poverty? Yes I do. The problem is that many, and I include myself here, find themselves somewhat shockingly, to be immune to images and even to the reality of material poverty amongst others. I flick the channels at the sight of yet another child ravaged by malnutrition, homelessness, injury in some godforsaken part of the world ‘out there.’ Over the years I have sponsored children through World Vision, give to other local care charities … cast off clothing and goods, books to be sold on or to assist. I’d rather give something I don’t want or need any more than sell. Perhaps that indicates some residue of generosity. But I feel I am not sufficiently generous any more. I do feel paralysed by the inertia of the size of global poverty. If I have the philosophical belief in the power of one, then what can this one person do? Like the movement to take some responsibility for the global warming crisis, there needs a personal response that is meaningful and appropriate to the individual, and it needs perhaps to take us face to face with the real tragedy of poverty … to see for ourselves. I wonder if we had the ‘beam me up’ technology of StarTrek, if we could somehow materialise ourselves into the middle of a refugee camp or a slum or the empty kitchen of a fellow citizen would our behaviours change … and for how long? Living simply so others might simply live is another mantra that is attractive and possible for individuals. The price of a meal a week given to a charity would be meaningful; I remember setting up a 40 Hour Famine group in my last year or so of school some 40 years ago now and being met with hostility by the parents of my fellow students. It wasn’t healthy apparently! Maybe … but it was effective in bringing the power of our imaginations and reality together. Whatever I can do … with cash, goods, by living a little simpler and resisting the lure of more nice things, lobbying any politician out there, through volunteering to assist in adult literacy … because there is poverty of another kind when a man or woman cannot read … is what I have been thinking about doing on this Blog Action Day. I’ve not polished or edited this post very much and I’d ask you to see it more in the nature of a diary entry to myself. Thank you for reading this far.